Of course I had, but that was beside the point. My mind, just like the moonshine distilling in the garage, was clear. The fact is, it was the most reasonable explanation for what was occurring. You see, funny things have been happening recently in the Retire29 household bank account. I haven’t done anything different. I still work the same hours, at the same job, and at pretty much the same salary. But, a couple months ago, my wife started seeing these huge amounts of money flowing into our bank account. Over $1,000 a month, and steadily rising. Already today, it’s risen to $1,044. I, being generally oblivious to all things dealing with money, had no idea—the wife keeps tabs on those sort of things. When she saw all this new money, my wife came to the only natural conclusion. I’d been talking about it for years—bringing up the idea every time money got tight. So, she could only figure that, yep, Eric finally became a heroin mule. When she confronted me about it, I adamantly denied any knowledge or wrongdoing. I mean, I don’t even like heroin. I couldn’t explain the money. I was as clueless as she was. Then, one day I was jogging around my neighborhood and I saw them. First, in my backyard. Then, down the street by our local minimum-wage gas station—WaWa. Thousands of them. Three leaves on each. 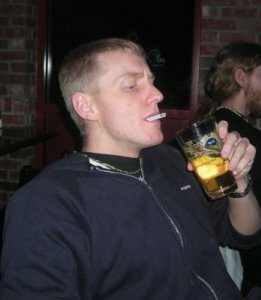 A smoking gun if there ever was one. I ran home and told my wife what I thought was going on. These $1,000 payments had to be coming from somewhere, from….someone. But, who? And….why? The clovers did the talking. By my estimation, on or around St. Patty’s Day, a leprechaun had taken up residence in our backyard. Around the same time, said leprechaun had found employment at the local WaWa. At $7.25 per hour, a full-time, minimum-wage leprechaun would take home around $1,000 after payroll taxes and 15% for federal and state. The leprechaun would have had no trouble lifting my routing and account numbers from the sensitive documents I often place neatly on top of our recycling bin. The puzzle was putting itself together. It seemed plausible. But, of course my wife is far more discerning. My wife obliges, but is noticeably agitated. Her skepticism of my leprechaun theory is obvious as she paces the floor. Toddler29 sits indifferently on the couch, eating a bowl of yogurt. “Maxing our 401k deferrals are just the start. We’ve also been maxing-out our IRAs into dividend-growth stocks. Then those covered calls you’ve been writing add some fuel to the fire. Then there’s the constant reinvesting of paid dividends. In 2016 alone you received over $10,000 in dividends that all got thrown back in the kitty. Most of these dividends are of the qualified variety, also. So, no taxes in our 15% tax bracket. For all intents and purposes, my current nest-egg now kicks out enough cash via dividends that the portfolio now makes more money each month than a person (or leprechaun) working full-time at the national minimum wage. That’s pretty cool. This journey to, presently, $1,044 per month in dividends was not without hiccups, of course. I’ve experienced about a half-dozen dividend cuts (Kinder Morgan, HCP, BHP Billiton, National Oilwell Varco, to name a few) and another half-dozen or so all-out dividend suspensions (Atwood Oceanics, Hi-Crush, Textainer). The oil and commodities rout of 2013-14 was brutal on earnings and dividends of energy companies, resulting in a lot of lost income. However—and this is important—a diversified portfolio crossing many sectors and levels of growth will withstand those company- and sector-specific trials. So, despite the oil selloff, many other companies flourished over the same time (like Vail Resorts, McDonalds, or Microsoft), hugely increasing their dividends. This is particular reassuring when expenses seem a bit out of control. When we lived in NYC for a year between 2014-15, we were vastly overspending our income. Likewise, these past six months we’ve spent a fair amount of money finishing our basement. Dividends softened the blow of these periods of financial stress. While I was spending most of my “active” income, I knew that behind the scenes (within my brokerage and retirement accounts) shares were paying dividends, being reinvested, and slowly but continually pushing me toward financial independence. Since I mentioned it, here’s where I stand on the path to financial independence. My net worth today is $490,602. That’s about six grand less than last Friday, but about 12.6% higher than my last update in mid-November. That’s been an expensive six months, too, as we spent around $22k on our basement. But, the $6k+ in dividends received in that time greatly helped push the needle upward. There’s really no magic formula to all of this. Having a good salary helps, but we’re middle class for our zip code, and we have a StayAtHomeMom29. Paying yourself first via 401k and automatic IRA deferrals is hugely important in ensuring your effective tax rate is low and largely removing human behavior from screwing things up. Then, managing passive expenses and only spending money on what brings you happiness takes care of most of the rest. I continue to believe that retirement around age 35 is entirely plausible. 35 is a year later than I expected when I first started Retire29. This belief is based on the careful calculation that having a million-dollar net worth, which includes a modest paid-off home, five years of expenses in current accounts, and the remaining balance in retirement accounts is sufficient enough to retire when expenses are not grandiose. Of course, knowing how much you spend is essential to having this comfort. Dividends historically grow at about the same rate of earnings growth, which is about 9% per year for the S&P 500. My portfolio current yields 3.06%. Thus, if I never add one more dime of new money, dividend growth and reinvestment alone will result in total passive income growth of about 12% per year. By the time I’m 45 (13 years from now), that will mean I’ll be at $4,700-ish in passive income, which is roughly our monthly expenses today (which includes a mortgage). 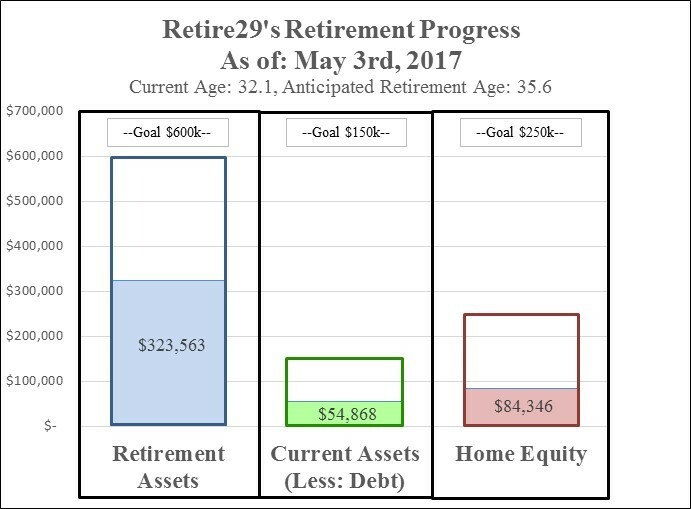 So, if I never pay off my house (which we will), and save another dime (which we are), I’ll still be financially independent at age 45. No leprechauns necessary, just dividends. Ahh… dividends. Those magic little workers providing us with an ever increasing passive income stream just because we bought a few shares of stock. You have to love it. They still remain my favorite form of passive income. Thanks for sharing your own Leprechaun story. 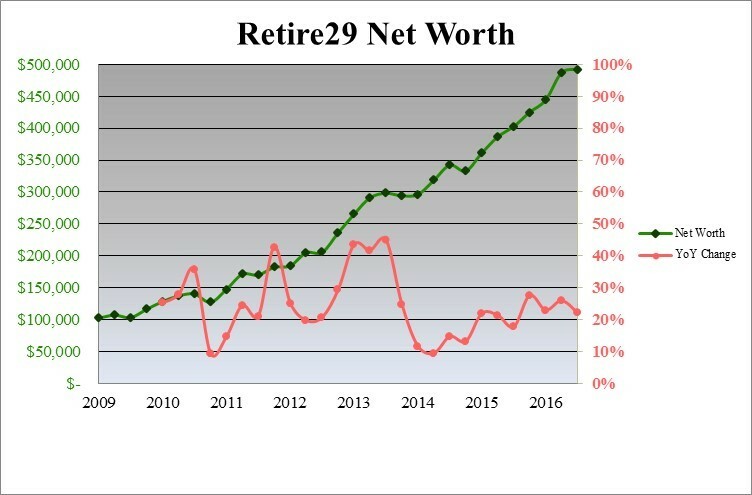 New to your blog,Goo luck at trying to retire at 35.6 years. Great stuff man, glad I discovered your blog.